One of my favourite aspects of working at Selective Asia (aside from my wonderful colleagues, of course!) is the recce trips – travelling to a region that is undiscovered, or being the first to sample a new experience. When it came to planning my recent Sri Lanka holiday, I was keen to test out Ahaspokuna Bushwalks Camp, a recently opened tented camp operated by the experienced team behind Mahoora. I really enjoy walking in the great outdoors, albeit usually in the South Downs, and Ahaspokuna’s programme of trekking in pristine wilderness particularly appealed to me. Also of interest was the camp’s remote setting in the central highlands of Sri Lanka, an area well away from the main touristic regions, and new to the SA team. So I booked onto the two-night package – all in the name of research, of course. The meeting point felt a little clandestine, with our Selective Asia guide receiving frequent directions from the Ahaspokuna team as we followed winding roads into the hills, before losing mobile coverage. I must admit to feeling a little unsure as we approached a 14km road marker! Seemingly in the middle of nowhere, this was the designated drop off point, but there was nobody in sight – until, as if by magic, three men stepped out of the bush clad in Ahaspokuna t-shirts – our welcoming committee! We were handed wooden walking staffs, and after bidding farewell to our Selective Asia guide, we followed the men back into the bush and began the 20 minute, predominantly uphill walk, which took us along the banks of a stream to a large clearing, the setting of our unique Bush Camp. Here we were warmly welcomed with smiles and fresh fruit juice, before being shown to our home for the next two nights – a tent built on stilts. Now, this is not your common-or-garden camping experience - the tents have been imported from Africa (a country which knows a thing or two about safari tents), and include a spacious decked ‘lounge’ area, a bedroom tent with a proper double bed, a separate bathroom tent complete with hot water shower and flush toilet, and a dressing area, all under one large canvas awning. Oh – and behind the tent, under the cover of the trees and raised slightly off the ground, was a private bathtub. Just a regular white bathtub that you would find in many Western homes, connected to hot and cold water! This was a world away from the last time that I slept under canvas, which was on the slopes of Mt Kilimanjaro! Having settled in (i.e., explored with the excitement of children!) we returned to the dining tent in time for lunch, which was an equally remarkable offering – a multi-dish Sri Lankan curry. How the cook managed to rustle up such delicious, attractively presented food in such a remote setting was beyond impressive. Although we were now considering an after-lunch nap, it was time to don our walking boots and explore our surroundings for the first time. Equipped once again with our walking staffs and accompanied by our naturalist, Gayan, and a local bushman - Nava - we headed out of camp into the bush. The local trackers are essential, as they know the area well and there are hardly any discernible paths through the grassland and forest. They also keep an experienced eye out for signs of the wildlife that calls this region home, ensuring your safety at all times. Large mounds of dung showed undeniable evidence of the elephants who frequently roam the forest, but the animal itself remained elusive. Our three hour trek was steep in places, and the terrain tough-going, but the scenery rewarded us with forested mountains, interspersed by rice-covered valleys as far as the eye could see, and barely another soul in sight. 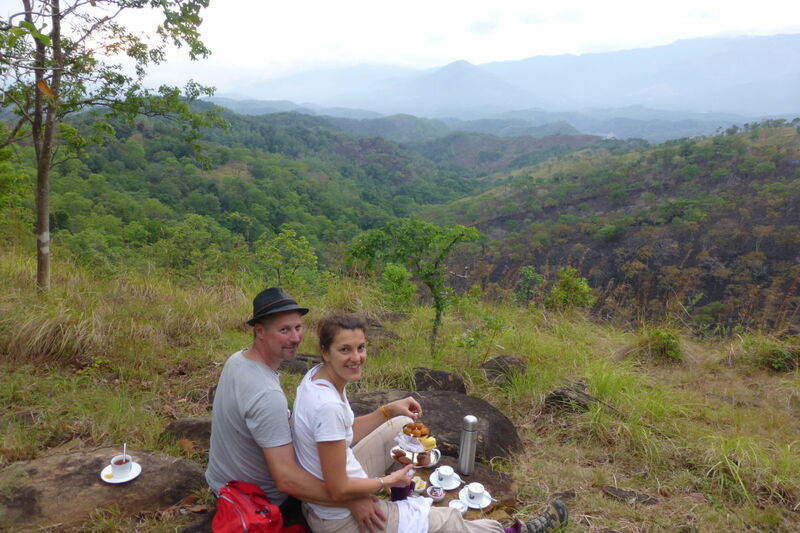 Towards the end of the trek, as we came out of the trees into a clearing – would you believe – a member of the Ahaspokuna team was waiting to serve us afternoon tea and, taking a seat on a flat rock with a beautiful view, we tucked into bite-sized Sri Lankan snacks and supped on freshly brewed tea. Back in camp, we had time for a much needed shower before Gayan came to collect us from our tent (it’s not advisable to wander around at night unaccompanied) and escorted us to the camp fire that was flickering away next to the dining tent, for pre-dinner drinks. Another enjoyable multi-course meal followed, accompanied by wine, after which Gayan led us on a short stroll around the camp site spotting nocturnal wildlife before accompanying us back to our tent. I thought the nervous excitement of sleeping in a tent surrounded by wildlife and nature might keep me awake, but cosily ensconced under the duvet and with all the fresh air and exercise – and possibly also the wine - it didn’t take long to doze off. We were woken early by the sounds of the forest. This remote region is home to over 50 species of bird, and that morning they all seemed to be in full voice! After a hearty breakfast of kola kenda (herbal porridge – don’t knock it til you’ve tried it), scrambled eggs and fresh fruit, we were ready for the challenge of a full day trek. Joined again by Gayan, and following the lead of Nava, we departed the camp in a different direction to the previous afternoon, this time starting with a (comparatively) leisurely stroll through a nearby village, much to the bemusement of the inhabitants we met en-route, who are still largely curious about foreign visitors! It wasn’t long before the terrain changed and, having walked through a farmer’s field on the edge of the village, it was time to climb. Over the course of the morning we scrabbled over rocks and trekked up steep hillsides, pausing for Gayan to point out indigenous plants and the occasional small creature. The day was heating up and we were starting to flake, but on reaching the mountain peak, the fresh air and incredible panoramic views made the hard trek worthwhile, and there was an enormous sense of being away from it all, surrounded by nature. Time for a rewarding rest and lunch, which comprised of fresh fruit, roti & sambal and helapa – a rather moreish Sri Lankan sweet. Having spent most of the morning trekking upwards, we correctly deduced that the afternoon hike would be predominantly downhill, although as we stomped through the forest, tree roots and wet leaves provided a different type of challenge. Seven hours after leaving camp we returned – weary, sweaty and a little grubby, but happy and slightly smug at our trekking achievement. We timed it perfectly: as the black clouds that had been hovering during the day finally erupted with heavy rain, we were safely back in our tent where we spent a relaxing hour on our covered decking drinking tea and reading as the light faded. Dinner was a BBQ feast, cooked on an ingenious converted wheelbarrow, and after a few glasses of wine we retired to our tent, feeling tired but content. We were woken in the night by an incredible thunderstorm. We watched in awe from the cosy confines of our ‘bedtent’ as lightning lit up the campsite. Thunder claps seemed to occur directly above our tent and the rain drummed down onto the awning. Somehow we managed to drift back off to sleep, and when the morning light flooded into the tent there was no sign of the soaking the canvas had withstood the night before, and it was already heating up to be another warm day! A surprise pre-breakfast coffee was delivered to our tent - one black and one with milk, just as we like it – as we packed our bags in preparation for our departure. After a final breakfast, we bid farewell to the team and followed the downhill route along the stream back to the main road, where our Selective Asia guide was waiting. Would I recommend Ahaspokuna Bushwalks Camp? Most definitely for the right person. The treks are undeniably challenging, but the views and sense of remoteness far outweigh the tough going. And the camp itself is a hidden gem: unique, extremely comfortable accommodation; hearty, home cooked food and genuinely friendly service. Go now, before the word gets out!